There are many ways to cook brussels sprouts. Roasting has become the go-to method of late, but proper steaming is wonderful, as are raw preparations, searing, and using these doll-size cabbage heads as ingredients in other dishes. Find some of my favorite ways to use fresh brussels sprouts below. First things first, brussels sprouts need to be trimmed before you cook them. Trim off the stem end - particularly if it's started to brown at all. Some people cut an "x" into the stem to help the core cook more evenly, or even cut the core out. Both are a lot of work for very, if any, pay off. One thing to be fussy about, though, is peeling off the darker outer leaves of sprouts - they have a stronger flavor and longer cooking time than the paler green leaves underneath. Roasting tames the sharp edge of brussels sprouts and heightens their inner sweetness. Roasting brussels sprouts is super easy too, in the end it really comes down to popping them in a hot oven. Yet, there is a bit more to it. For step-by-step details see How to Roast Brussels Sprouts. You may then want to take the leap and make a favorite: Bacon-Roasted Brussels Sprouts. Okay, sure, baking is a lot like roasting (see above). Here, however, we're using it to refer to making a baked casserole - or gratin, to be fancy - of brussels sprouts. Put trimmed brussels sprouts in a baking dish, splash on a bit of cream, top with some grated cheese, and bake until browned and tender. Yummers. There are two simple tips for keeping steamed brussels sprouts delicate and tender instead of stinky and soggy: keep the water to a minimum (that is, truly steam them) and don't overcook them. 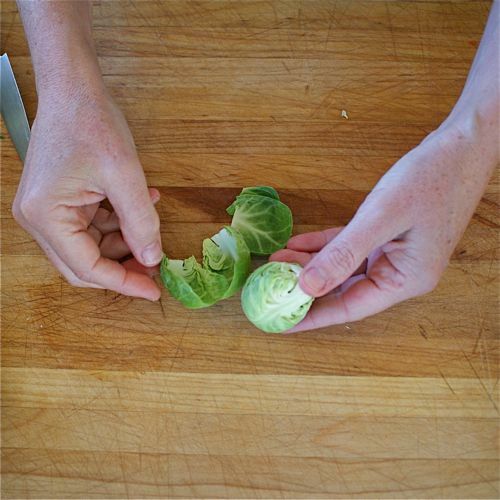 See How to Steam Brussels Sprouts for a full recipe. Use a hot pan and enough oil or butter to keep the brussels sprouts from sticking to bring out the nutty flavor of brussels sprouts while turning them wonderfully tender. Cook, stirring frequently, until tender and browned. If the idea of raw brussels sprouts sounds like a bit much to you, give this Brussels Sprouts Salad a try. It's a real favorite and the spicy dressing counters the sharp flavor of raw brussels sprouts nicely. Or top brussels sprouts with creamy dressing similarly tempers that raw cabbage bite—use your favorite cole slaw recipe. Yep. You can totally toss brussels sprouts on the grill. Do this when you have slightly larger-than-average sprouts on hand (all the better to keep them on the grill!). Trim the sprouts, toss them with oil, and pop on a not-too-hot grill until browned and tender, 8 to 10 minutes total. As long as you're cooking them in a rich broth, brussels sprouts can be cooked in soups without taking on the funky edge of boiled cabbage. Cook them gently and give Cream of Brussels Sprouts Soup a whirl (literally). The nutty flavor of brussels sprouts can be used to excellent effect in a pasta dish that uses eggs and freshly grated cheese to make a quick sauce.